Eastern senior Jessica Cook competes in the girls high school race as part of the Patty Forgey Invitational cross country meet on Sept. 23 in Rio Grande, Ohio. PICKERINGTON, Ohio — For the Eastern High School girls cross country squad, both bad and good, this has happened before. Only this time, it’s a different Lady Eagle advancing to the final 5K race of the campaign. 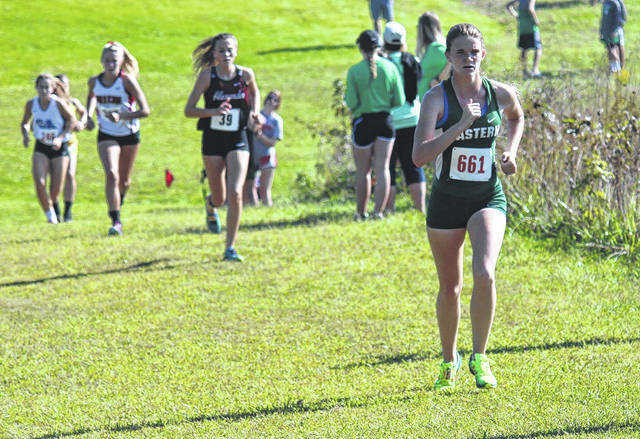 That’s because Ally Durst, an EHS junior, did qualify for next weekend’s Ohio High School Athletic Association state meet —after placing inside the top 20 at Saturday’s Division III regional meet at Pickerington North High School. While the Lady Eagles advanced to the regional for the seventh consecutive season as district champions, they aimed to return to the coveted state championships as a team — for the second time in four years. But, for the third straight year — and after back-to-back regional meets in which they fell one spot shy of qualifying for the state as a team — Eastern ended up on the outside looking in. As the top five teams at Pickerington qualified for the state, the Lady Eagles earned an eighth-place finish with a score of 214. The top five featured champion Mount Gilead (40), runner-up Fredericktown (120), third-place Zane Trace (124), fourth-place Garaway (136) and fifth-place Centerburg (148). Immediately ahead of the Lady Eagles were Galion Northmor at 184 and Grandview Heights at 191, as Eastern was sixth last season — when once again five teams made it to National Trail Raceway. Two years ago, when the top four teams and top 16 individuals advanced, Eastern once again was the first one out — thanks to the fifth-score tiebreaker with Fairfield Christian. Speaking of 16, though, Durst finished 16th overall in exactly 20 minutes and 18 seconds. Thus, by crossing among the top 20, she will represent Eastern individually — as senior Jessica Cook claimed that honor the past two years. There were 133 runners in the girls high school race, as Durst’s time was eight seconds faster than the 20th overall time. This will be Durst’s first trip to the state, as she finished 30th overall in 21:38 in last season’s regional. For Cook, she was vying for a fourth and final berth, including the past two as an individual. But unfortunately she placed 31st, completing the weather-slopped course in 20 minutes and 58 seconds. Last season, she ended up 18th in 20:45, while finishing fifth overall as a sophomore — in exactly a minute faster than her time in 2016. The remaining runners for Eastern included freshman Whitney Durst (73rd in 22:31), junior Rhiannon Morris (75th in 22:32), senior Kaitlyn Hawk (81st in 22:51), sophomore Lexa Hayes (86th in 23:00) and freshman Alyssa Howard (129th in 26:43). Morris, Hawk and Hayes all ran in last season’s regional, and all improved their places and times from a year ago. Southern sophomore Sydney Roush ran in her initial regional race, and finished 82nd in seven seconds shy of an even 23 minutes (22:53). On the boys side, both Eastern runners competed at the regional, as senior Owen Arix (37th in 17:40) and sophomore Colton Reynolds (48th in 17:56) finished 11 places and 16 seconds apart. Southern senior Larry Dunn, after a 38th-place performance last season, was 68th overall in 18 minutes and 21 ticks. Visit www.baumspage.com for a complete list of results of the 2017 Division III regional meet.